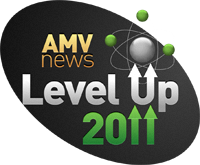 AMVNews.ru holds the second thematic contest of Level Up series. The main idea behind the contest is to join forces of pro and novice music video creators and make them work in pairs. Partners exchange experience, and novice gains new skills in video making from his/her "elder" teammate, thus increasing his/her level drastically. As the previous contest showed, this concept draws much interest of creators as well as of viewers' audience. Thе contest is opened for pairs of AMV makers, Pro (experienced and acknowledged creator)+Novice (a beginner without significant achievements). A team’s goal is to create a small AMV through joint efforts, with the assumption that Pro doesn’t do editing and does not work on effects but does what he/she can to support the Novice technically. 4) Pro is oblidged to provide links to his/her videos. Novices are recommended to do so, because Pros rarely choose totally unexperienced Novices. 5) As the number of Pros is rather limited, we recommend Novices to contact a Pro you want to work with directly (via private message, for example) with a request to participate in contest together. Registration as an individual participant does not bind you to anything, it’s just a preliminary list. When your name appears in the list of participants, it is only to show the other contestants that you wish to take part in the event. There will be no random pairs of participants. You must define your partner and register for the contest as a pair up to the deadline, which is the 31st of December. Videos will only be accepted from registered pairs. The contest will be held only if there is no less than 10 videos accepted from registered teams. Contest video can be made either of anime movies, anime series and Japanese videogames or of manga. Other footage is accepted only if it makes no more than 50% of the video. No restrictions on music styles. Videos premiered after September 15th, 2009 are eligible, as well as videos made specially for the contest. The contest video is eligible for participation in other contests. Each team is allowed to submit one video only. You must know exactly the title of anime/videogame used for your video, as well as the title of the music composition and the name of its performer.Unkown music and animes/videogames are not allowed. The length of contest video may not be less than 1 minute (without credits). It is not recommended to use pieces of a video somebody else created in your work. In case such pieces are used, they should be listed in credits among other sources, without exception. An obvious plagiarism is strictly prohibited and is to be banned from participation. AMV News and/or the contest title must be mentioned in the video, how exactly to mention is to the team’s choice. A line in credits should be enough. 4) There are hard subtitles or logos not justified by artistic intent. - Full version is to be compressed at the rate of no more than 25 MB per minute of the video. If HD-sources are used, the limit can be extended to 40 MB per minute. - Preview version: file size strectly at the rate of no more than 3 MB per minute; resolution width 480 pixels. Encoding combination x264+AAC+MP4 is highly recommended. Recommendation: If you submit an HD-version of the video, it is suggested to add a standard definition version as well. 1) Videos can be submitted from February 1st through February 20th, 2011 only by Pro of a registered team. A Novice may add the video only in case that Pro had posted his/her approval via private message. 2) Fill in the application form located here: http://amvnews.ru/index.php?go=Files&file=add. Choose “Level Up 2011” as one of the categories. Make sure there was a site message "Thank you, your video has been added successfully" after the upload. Here you can see whether your video was added to the list for moderatorial check. Then you’ll either wait yours turn to see the AMV on site or you’ll get a private message from administrator requesting to correct the deficiencies found during the check. Your AMV moderatorial check status will be posted in special topic. If any questions arise, contact the administrator via private message. There will be two rounds of voting via the on-line form on the site. All Pros of all registered teams take vote, as well as the members of a specially chosen jury. If a team’s contestants do not take vote, a small fine will be imposed on the team. Registration of jury members will start later in a special topic. Ну вот так более или менее прилично. Если нашли ошибки, пишите. Я исправлю. Ну очень много ошибок, проще переписать заново, чем править. Рекомендую заменить нынешний перевод на тот, что в приложении, а если будет нужно перевести еще что-то, то лучше сразу обращайся ко мне.